Rose and Gordon Wright and Graaff-Reinet farmer Tim Murray at the world’s largest food festival, Terra Madre Salone del Gusto in Italy. 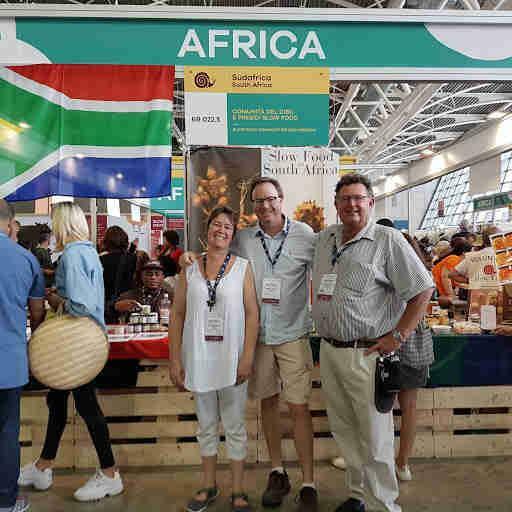 GRAAFF-REINET NEWS - The world’s largest food festival, Terra Madre Salone del Gusto is an event organized by the City of Turin, Slow Food, and the Region of Piedmont in collaboration with Italy’s Ministry for Agricultural, Food and Forestry Policies. For four days at the end of last month, participants enjoyed workshops, cookery demonstrations, debates and discussions on food-related topics as varied as climate change to the role of bees. This year, a small delegation from the Karoo was privileged to be part of the event, with well-known Karoo chef Gordon Wright honoured to be one of the top 50 international chefs invited to cook a traditional dish in the International Kitchen. Gordon’s wife Rose, Graaff-Reinet farmer Tim Murray, and Mike and Pam Neebe from Axe Hill Wines in Calitzdorp completed the Karoo line-up. Over 50 chefs from the Slow Food network took turns in the kitchen, cooking up delicacies and specialities from around the globe, taking visitors on a journey through world gastronomy. Gordon was one of the chefs given a time slot to showcase South Africa’s food heritage as well as do a short presentation on a specific dish and its history. After the demonstrations, the public then had the chance to purchase and taste the dishes. Naturally, Gordon’s peanut chicken dish was a hit and sold out very quickly. “It was a great honour to be invited as one of the chefs to cook in the International Kitchen,” said Gordon. As well as the International Kitchen spot, he also gave a workshop on meat preservation techniques from Africa to Hungary, working in collaboration with a Hungarian chef and Italian salumier Federico Fiamozzi, who spent time training with Gordon in Italy in 2012 and has since done an apprenticeship in Graaff-Reinet with him in 2016. They were joined by Mike Neebe and Francesco Cinzano of Cinzano Spumante wine fame. Gordon was also part of a team of South African chefs who gave a “Nose to Tail” workshop. While Gordon was busy cooking up a storm, Tim Murray and the Neebes had a great time introducing the Karoo and its wonderful products to the participants from around the world. There was a lot of interest in the Karoo and the unique products that were on display: the wines, the pickled agave buds and the range of Agavesol healing skin products.